Anyone who’s bummed their way through a season or two knows the importance of being on a first-name basis with patrol, avoiding your buddy’s landlord and keeping your options open whenever new storms arrive. 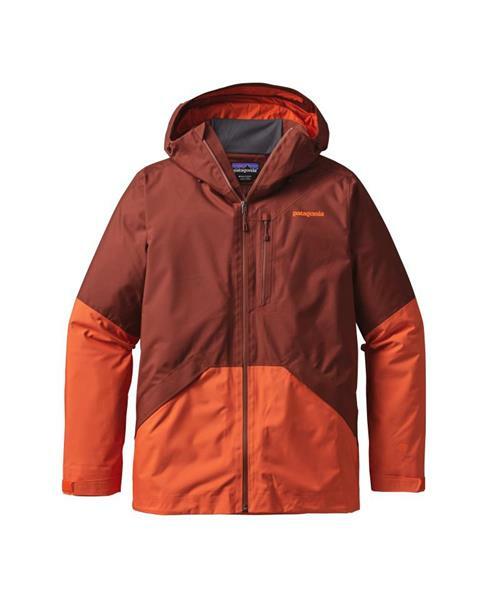 Patagonia's motion-friendly Snowshot, designed for superior comfort and mobility, lets you slip through the season’s highs and lows like a local heading to a secret stash. For creative link-ups in the pillows and trees or dropping into fresh steeps, Snowshots have a fabric package that includes a burly H2No® Performance Standard 2-layer polyester shell with a waterproof/breathable barrier for storm protection. A DWR (durable water repellent) finish increases the fabric’s durability and keeps you dry when you’re flying through mucky weather. Lightweight, slick mesh lines the body and sleeves to wick away moisture and provide a smooth glide over layers. Articulated arms let you move naturally, and pit zips offer up a quick-venting option when you’re working up steam. Weather-sealing features include a 2-way-adjustable, helmet-compatible hood with a laminated visor; soft microfleece panels for your neck and chin to protect from wind blasts; and a low-profile powder skirt (with webbing loop that connects to any Patagonia® Snow pants) that provides an always-ready seal when you’re in the deep. Zippered pockets: two handwarmers, one chest (with media pocket and cable routing) and one internal stash pocket. There's also an internal drop-in pocket for goggles and gloves. With an updated technical silhouette and an embedded RECCO® avalanche rescue reflector.